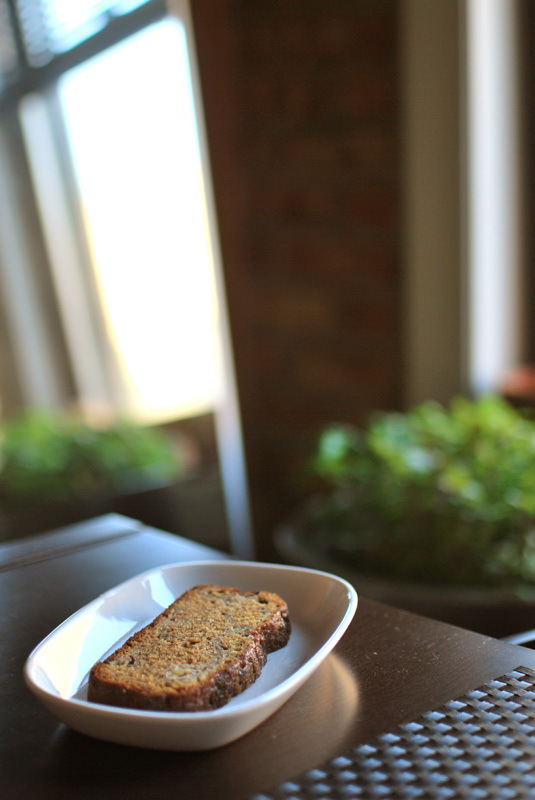 The final banana bread for this week comes originally from that venerable tome, The Joy of Cooking. It promised a more “cakey texture” than the standard banana bread, due to a slightly unusual mixing method. This was a claim I decided to test to its very limits. Typically, banana bread (and other quick breads) are made by mixing dry ingredients together, mixing wet ingredients together, then gently blending the two together; this is generally the method I’ve been using all week, with slight variation here and there. This method is known as the “muffin method”, since it’s mainly used to make muffins. Obvious. The newer method, as proposed in The Joy of Cooking, is called the “creaming method”, as you “cream” the fat (usually butter) and sugar together. No, I don’t know why it’s called that; I’m certain there’s some fascinating etymology there, but I don’t know what it is. Frustrating! Long story short, the creaming method produces lots of tiny air bubbles in the fat, which leads to a lighter end product. In addition to creaming the sugar and fat together (mildly unusual in and of itself), this recipe directs you next to add the flour, then the eggs, then the banana. So unusual! This method would at first appear to overmix the flour, resulting in a tough quick bread. But not necessarily so; sometimes you want to produce a bit of that tough gluten, to provide a chewier structure in the final product. So the theory goes, anyway. Me, I wasn’t totally convinced. Despite the fact that I know the recipes in The Joy of Cooking have been tested and retested to perfection, I decided that I knew better. I decided that there was just too much sugar, so I reduced the amount. But since sugar provides moisture in a quick bread, I replaced half of the reduced sugar with moisture-rich and condensed-sweetness honey, thus keeping the sweet flavor level the same, while providing extra moisture. Or something like that. What I failed to realize, in my quick re-engineering of the recipe, was that honey doesn’t cream like sugar does. In fact, I don’t believe honey creams at all. To properly cream, one needs the hard crystalline structure of granulated sugar, not the liquid invert-sugar quality of honey. I realized this only after I put everything in the mixer: the precious room-temperature butter, specifically. There was really nothing left but to continue on, and see what resulted. As it turned out, I didn’t get the lovely cakey texture promised. I ended up with a fairly standard and moist banana bread; though it was strangely orange in color, except where the pale (and occasionally purple!) bananas marbled through. Why?! I’ve no clue! I did let the smashed bananas sit for a little while, and they turned brown on me; I’m assuming that’s the reason, but I’ve never had a banana bread turn purple before. So strange! The top crust, sprinkled liberally with coarse turbinado sugar before baking, ended up with a delightful crunch. I will definitely use this method in other applications, perhaps blending the sugar with finely chopped raw nuts for extra flavor and texture. The side and bottom crusts, though, ended up looking very dark, and were full of burnt-caramel flavor. This was not unpleasant, even though I’m usually not a fan of burnt flavors. Overall, this was not exactly what I expected from the recipe; but I can’t complain, as I changed it fundamentally. But I did get a very nice banana bread. In fact, that’s the biggest lesson I’ve learned this week: there’s no such thing as a bad banana bread. Banana bread is extremely forgiving. You can smash up two or three very ripe bananas (remember, the blacker, the better! ), mix in some flour, some milk and eggs and spices, use some fat and sugar, and you’ll probably end up with something delicious. Yes, to get the best banana bread for your palate, you will have to tinker with recipes, perhaps adding a little cinnamon here, reducing a little sugar there, but ending up always with something uniquely yours. None of these recipes are very different on paper, but they turn out very different results. I urge you to play around with them, tinker away as you will. Even a slight adjustment in method or amount of ingredients will change the result greatly. 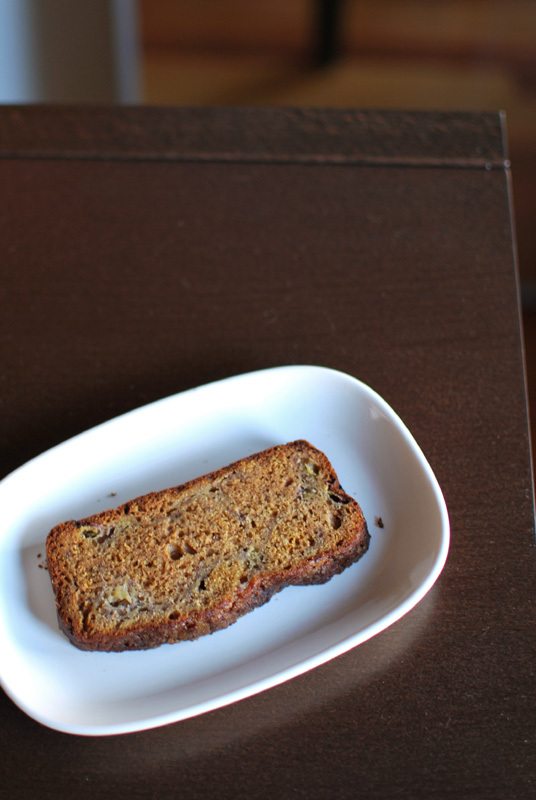 If you’re still looking for your signature banana bread – and every cook should have one! – just start baking. Eventually, you’ll find just the right combination for you; I know I have! And if you end up with something you don’t love, it’s no hardship to taste test to make darn sure. Besides, I know there’s always someone you can gift any test batches to; it just might be the best banana bread they’ve ever tasted. Every recipe is a winner in someone’s eyes! orange and purple - why?! 1. Preheat the oven to 350° F. Lightly butter a 9 x 5 inch loaf pan, sprinkle with flour, and turn upside down and knock on the bottom to remove excess. In a medium bowl, whisk the flour, salt, baking soda, and baking powder together; set aside. 2. Using an electric mixer, beat the butter, sugar, and honey together until lighter in color, about 3 minutes. Add the flour mixture and mix at low speed until incorporated. The mixture will look crumbly and dry, like brown sugar. Add the eggs and beat in slowly until incorporated. 3. Fold in the smashed bananas by hand, taking care not to overmix. Transfer the batter to the prepared loaf pan, smoothing the top. Sprinkle the turbinado evenly over the top of the batter. 3. Bake at 350° F for 50 to 60 minutes, or until golden brown and fully baked. A skewer inserted into the center should come out clean when done. Remove the bread from the oven and allow it to cool in the pan briefly before turning it out onto a rack to cool completely. Serve warm.